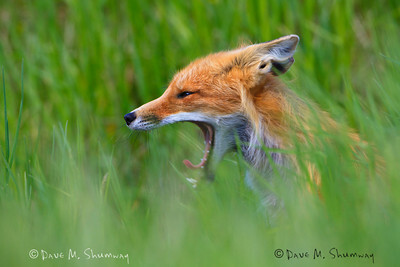 A Red Fox yawns as the sun sets on Waterton Lakes National Park in Alberta Canada. Captured with a Canon 7D with 500/4.0L IS + 1.4TC III in aperture priority mode with an exposure bias of 0 at ISO200, f/7.1, and 1/125th of a second. The camera was resting on a bean bag. I used a couple of friends wedding as an excuse to make a four day trip up to Glacier National Park, and I am glad that I did. The wedding was in Kalispell, MT on Saturday night, so I raced up to St. Mary (East Glacier) the first chance I got on Friday. I got to the park later than I wanted to; but I made it in time to shoot as the sun was setting and the moon was rising at Wild Goose Island. The light was not ideal; but I was able to make something out of the scene with some HDR processing (not really in line with my usual look; but it is something to show the scene that night). I actually made it early enough to do a bit of scouting for the following morning's sunrise (and second sunrise) before it was time to attempt to photograph sunset. I camped in the Rising Sun campground, where I came to the realization that I am spending far more money than I should to be in a campground from 11:10p - 4:15a ($20 is a lot of money for a bare batch of ground, cold water, and dirty bathrooms... oh well) I was out early on Saturday morning to wait for first light at Wild Goose Island; but it was a bit of a bust, so I was off to my "second sunrise" spot. "Second sunrise" is a place where the sun takes a little longer to get around/over the mountains before illuminating the scene. This spot just happened to require 1,000 vertical feet of hiking/climbing to reach, and I was up against the clock (good thing all the cycling I have been doing has me in decent shape). The view back towards Wild Goose Island (from more than 1,000 feet above) was beautiful, as were the waterfalls that I had hiked up to photograph. When I was scouting the evening before I told myself that there was a chance that the top fall might be positioned to give me a rainbow when the sun hit it... and I was right. I was rewarded with this view of the seasonal waterfall, a rainbow in the fall, and Goat Mountain in the background, all with decent light. A few lapse to the road closed sign, some time watching a few different Black Bears, and I was off to Kalispell, MT to check into my hotel, shower, and dress nice enough for the wedding (that is why I was on the trip). Sunday morning I was up and on my way back to the park as soon as possible. I had no plans of heading to Canada; but every time I go to Glacier I bring my Passport/Passport Card, just in case. It was a good thing I did, because I decided that I wanted to head to Waterton Lakes National Park, so North I went. Upon arriving I was treated with some time around a beautiful Cinnamon Black Bear boar, who even stood up to attempt to pull down a birds nest from a small aspen tree. Into the park, using my Parks Canada pass from my July trip last year it was time to set up camp and shoot a time lapse sequence or two. I added lunch and some yoga to the afternoon agenda before heading off to see what I could find. I love Red Fox, I think they are some of the most beautiful creatures in North America, and I was lucky enough to spend the next three or four hours with one. It moved through the grass, rested, stalked Uinta ground squirrels, yawned a few times, posed in front of Middle Waterton Lake, caught a Uinta ground squirrel, ate it, and then came near to say goodbye. The Fox left just in time for me to make my way over to Middle Waterton Lake to set up a time lapse of what I hoped would be the moon rising as the sun was setting (I needed the clouds to cooperate). The clouds did not fully cooperate; but I managed a few decent photographs of the scene, and I have yet to look at the time lapse sequence. The next morning I was up early, yet again, to drive and hike to a favorite spot to photograph Cameron Lake and Forum Peak in the pleasing pink light of sunrise. Cameron Lake was still frozen and covered with snow (in fact I walked from the parking lot on a plowed path that was more than six feet under the snow). Heavy clouds rolled in and made the rest of the morning perfect for photographing waterfalls, Red Rocks Canyon, and even more waterfalls. Soon it was time to start heading south. On my way out of the park I stoped to photograph a pair of Sandhill Cranes that were being pestered by a half dozen Red-wigged Blackbirds, and then headed over to a favorite birding spot to watch some Western Wood-pewee feast on insects that were taking advantage of the ample supply of flood waters. I went in to Many Glacier; but it was raining hard (as it seems to always be), so I looked at the sheep and goats and continued towards home. The rain followed me all the way home; but around Lavina, MT the sun was setting and the clouds broke just enough at the horizon to grant me a few shots of the flooded area with a double rainbow all in the magical light of sunset. It was a great little four day trip. I have a few videos and time lapse sequences still to edit; but I wanted to get photos online before I race off to Yellowstone national park this weekend. Sounds and looks like you had a great time! I love the photo of "first light at wild goose island" and the "flooded area with the double rainbow".....gorgeous pics! The red fox images, I'll bet that was fun. Nice!